Muthayammal Engineering College, Namakkal has advertised in THE HINDU newspaper for recruitment of Teaching Faculty- Professor / Associate Professor / Assistant Professor jobs vacancies. Interested and eligible job aspirants are requested to apply as soon as possible from 03rd April 2019. Check out further more details below. 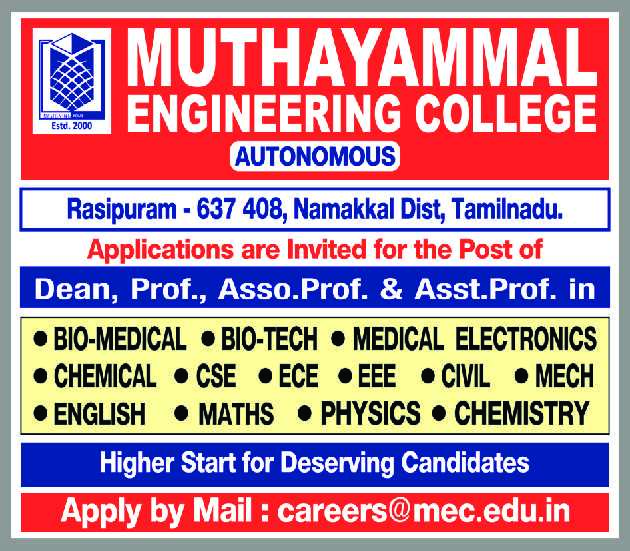 About College : Muthayammal Engineering College, established in the year 2000 under the aegis of Muthayammal Educational Trust and Research Foundation, is located in the congenial vicinity of Rasipuram, 25 Kms from Salem. How to Apply: Interested and eligible candidates are requested to send updated CV along with copies of certificates, testimonials and recent Passport Size photograph to the email address mentioned below.